Oregon Harvest 2016 Relaxed No rain to worry about this harvest season in Oregon. Most vineyards had been picked by the first week of October and wines were comfortably resting in barrel post fermentation. Since bud break was early in 2016, the season was comparable in length to the average in Oregon, even as much as 110 days for some vineyards. 2016 caps off three excellent vintages, all ripe and opulent, unprecedented for Oregon. Some have likened the warm vintage to Oregon’s 2006 vintage in that although the grapes were very ripe, the wines have good lift and modest tannins. Oregon Offers Unique Lodging Options The Mt. Hood Tiny House Village opened in May 2016 at Mt. Hood Village RV Resort & Campground in Welches, Oregon. Five tiny living spaces full of character ranging in size from 175 to 260 square feet and $129-$139 a night. 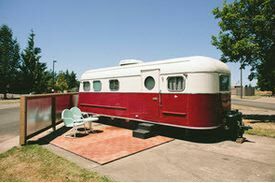 The Vintages Trailer Resort in Dayton halfway between Dundee and downtown McMinnville is located within the 14-acre Willamette Wine Country RV Park. Each unique trailer (example pictured below) offers amenities such as gourmet coffee from Caravan Coffee, luxurious terrycloth robes, comfortable mattresses and hotel-quality linens, and propane grills. A pool, hot tub and outdoor lawn games as well as an adjacent dog park and neighboring vineyards add to the appeal. Caravan-The Tiny House Hotel in Portland is the first lodging property of its kind in the U.S.. Six customfabricated “tiny houses” in the Alberta Arts District range from 100 to 200 square feet. The nearby Radio Room provides room service. The Society Hotel recently opened in Old Town Chinatown in Portland. The 36-room boutique hotel restores an 1881 building to its original purpose as a lodging house and a street level café is a bonus. Marriott is opening the Hi-Lo Hotel this winter, the latest in the hotel group’s Autograph Collection. The 120-room boutique hotel occupies the historic Oregon Pioneer Building, retaining Huber’s Café (the city’s oldest restaurant, with a dining room on the National Register of Historic Places). The hotel will feature modern organic furnishings and locally handcrafted amenities throughout. 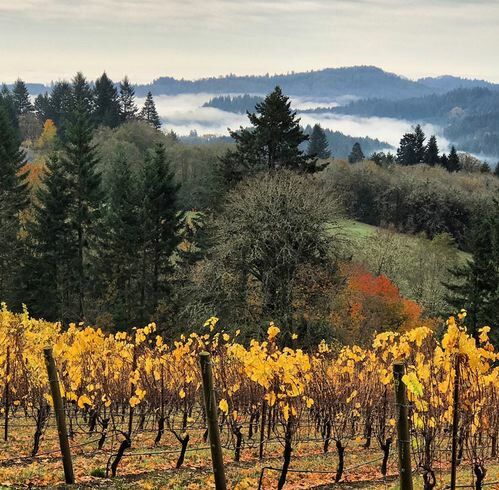 Jackson Family Wines Buys Willakenzie Estate Willakenzie Estate has joined Penner-Ash, Gran Moraine and Zena Crown as part of the portfolio of California-based, Barbara Banke-led, Jackson Family Wines. La Crema and Siduri, located in California’s Sonoma County, are Jackson Family Wines properties that also produce Pinot Noir from Oregon’s Willamette Valley. The acquisition of Willakenzie Estate includes the brand, winery, hospitality center, and 100 vineyard acres on the Yamhill-Carlton Estate and 25 vineyard acres of Pinot Noir at the Jory Hills Vineyard in the Dundee Hills. Jackson Family Wines also announced plans to build a large winemaking facility on the property they acquired from Evergreen Aviation in McMinnville in January of this year. The winery is expected to be finished in time for the 2017 harvest. ¡Salud! Achieves Record Amount ¡Salud! is an Oregon charity that provides health care services for seasonal vineyard workers and their families through Tuality Healthcare. The 25th anniversary event on November 11 and 12 raised a record $911,300. The money raised is used to provides services for about 5,000 annual medical and dental encounters to workers at 150 vineyards in the northern Willamette Valley. Alit Offers Unique Transparent Pricing Mark Tarlov, a founder of Evening Land Vineyards and now the proprietor of Chapter 24 Wines and Maison l,Envoyé, launched Alit with 3,000 cases of Willamette Valley Pinot Noir sourced from seven vineyards from the 2015 vintage. Tarlov chose a different winemaker (Alban Debeaulieu) and enologist (Pierre Millemann) that used for Chapter 24, made by partner and consultant Louis-Michel Liger-Belair of Burgundy. What makes Alit unique is transparent, direct-to-consumer pricing. That is, using no middlemen and charging the end customer the ex-cellar price for the wine. Alit's team figured out the cost of making their initial wine and arrived at a cost per bottle of $15. The bottle is marked up by $12.35 or 45 percent of the final bottle price that covers utilities, insurance, legal, compliance and marketing costs. Tarlov expects that about 25 percent profit will be left over for the winery.